What do you get when you invite four CEOs of real estate tech companies to talk about trends? You get the Onboard Informatics webinar. 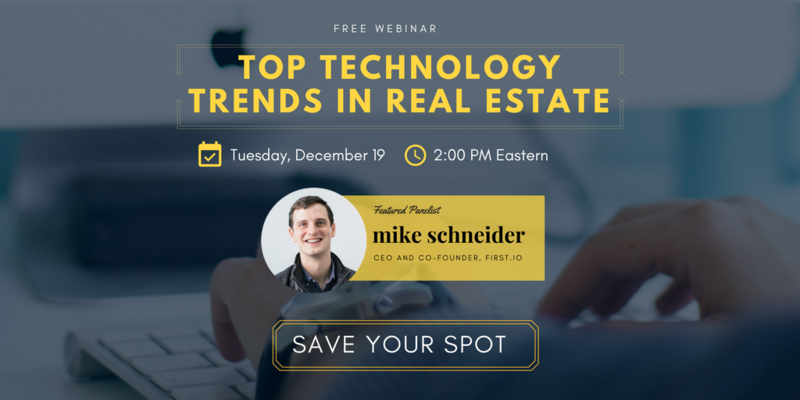 First CEO Mike Schneider joined HomeSpotter CEO Aaron Kardell, Relola CEO Heather Sittig Jackson and Pathway RE CEO Jack Berube for a lively discussion about what technology trends real estate agents need to be mindful of -- or ignore -- in 2018. The discussion started out with a question that affects many industries: is technology helping or hurting real estate overall? It’s not a clear cut answer. Mike noted that one of the biggest brokerages, Keller Williams, just started calling itself a technology company. That alone is indicative of how inextricable tech is from the industry. But it doesn’t diminish the relationship aspect of the business in anyway. Aaron Kardell echoed that statement. “Strong relationships still breed the most success,” he said. Technology helps make agents more productive, spending more time on the value adding activities. And Jack noted that agents need to focus on processes they want to improve, and resist the urge to adopt a technology that there isn’t a need for. One of the most drastic changes to real estate came about as a result of online search. The panel was asked to discuss how they each see this ripple effect, even ten years later. Jack felt that home buyers and sellers feel emboldened by the online tools, not relying on the skills of a Realtor for the transaction. But this doesn’t always favor the bold. “Search hasn’t changed how many people are moving,” Mike commented. “But it’s totally changed the role of the Realtor.” The agent is no longer being the purveyor of data, but need to be local experts. But what about artificial intelligence? Will AI be another sea change for real estate? Mike was cautious. First is built on machine learning, so there’s no question about the value of AI. But it’s not the giant killer some fear. “When ATMs came out, everyone thought bank tellers would go away,” he reminded the audience. “But in fact they became more valuable -- because of the human interaction.” That relationship can’t be automated or replaced by big data. First uses big data to augment and inform those relationships, helping Realtors find the people they already know and who are most likely to need their help. But he also cautioned agents to be informed consumers. Of course, no tech trends discussion is complete without mentioning new platforms and tools for consumers that might seek to replace the role of the Realtor. “Other new entrants will really shake up the industry when there is movement in how the transaction is facilitated and how compensation is structured,” Aaron said. Heather pointed out that the consumer has been the driving force behind all the changes, and the real estate industry, like most industries, needs to think about it with the consumer lens. For Mike, he also agrees there will be downward pressure on commissions. “However you feel that is happening, some agents will start competing on commission which may feel like a devaluing of agents in general. But both brokers and realtors need to shift from leads to defending your time and your network of relationships. That doesn’t happen through emails and postcards and magnets. When looking at ways to increase business, each CEO had a message for the agent. For Relola, it’s all about helping agents amplify the fact they are local experts. With the Relola app, they can broadcast their expertise through their social channels, for referrals, shares and more web traffic. Pathway RE shared a survey they’d completed. “Most agents spend 42% of their time on non-revenue generating tasks,” said Jack. “If we can give you back 20% of your day, that’s a significant recovery. Listen to the entire discussion here.